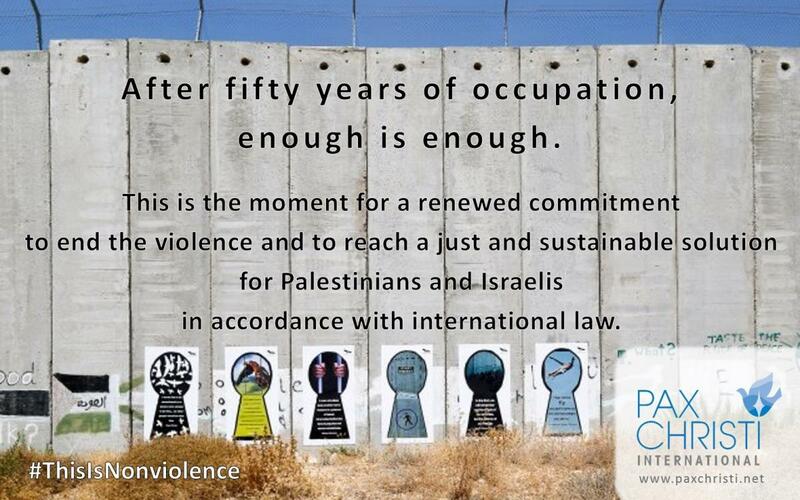 50 years of occupation: Enough is enough! U.S. President Donald Trump, labeled the ‘most mocked man in the world’, burst out in anger during his Bethlehem meeting with Mahmoud Abbas. Abbas was supposed to curb the ‘incitement’ of which Israel and the U.S. continuously accuse the Palestinian Authority. Trump’s Israeli information sources however showed him quotes that ‘proved’ that the incitement continued. A favorite subject in the incitement discussion is the Palestinian curriculum. All pupils in the West Bank, whether they are at government or private schools, follow the same curriculum. The Palestinian curriculum is centralized and standardized. At most there are a few additional subjects at private schools, such as a second foreign language besides English. In other words, the lesson books of my son Tamer are largely the same as anywhere else in the West Bank. I ask Tamer (15) how the Palestinian curriculum speaks about Israel. Tamer says that Israel is indeed a regular topic in the books. There certainly arises a negative image of Israel. However, it is not the result of direct negative attributions to Israel. The image comes in a more ‘indirect’ way he says. You will read that Israel takes away land from Palestinians. Because of the actions attributed to Israel, you draw your own conclusions and build up a negative image. The actions are well-known, he says. Trump refused to visit the Church of Nativity because he then would have had to walk along the tent with family members of hunger-striking prisoners. He demanded the tent be removed. The hunger strike of the Palestinian political prisoners was at the time of Trump’s visit a daily topic of conversation, until its cessation by the prisoners after 40 days on water and salt. As always when demands of hunger-striking political prisoners seem to be met by prison authorities, it is a matter of wait-and-see whether there will be a lasting change in the prison regime. A few days ago Mary went on a visit to the hospital in Beit Jala to meet the son of Imm Hassan. She is a peasant woman from a village, Ma’sara, to the south of Bethlehem. For years she has brought fresh vegetables and fruits to our former and present family homes. Recently she was elected as a council member in the village. Her son was just released after a stay of many years in Nakba prison (Negev desert). He had to be treated in the hospital after losing 12 kilos due to the hunger strike. I recently heard that in the refugee camp Aida near Bethlehem it happens that at a single moment no less than 200 of the 5,500 camp dwellers are in prison, mostly on accusations of stone throwing. In actuality most of the extended families there are likely to have a family member in prison, with all the ensuing worries and loss of income. Many more will have had a prison experience, once or more times. All of this obviously has to do with occupation. On June 5, the Arab Educational Institute has a four-hour program around the commemoration of 50 years of occupation, organized along the Wall in north-Bethlehem.